Barrington Irving is my hero today. And when he returns to Miami in the last week of May, the 23-year-old pilot will have set two world records: he will become the first African American and the youngest person ever to fly solo around the globe. 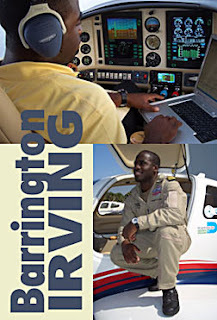 After being raised in inner-city Miami, Irving chose to make the world flight to inspire inner-city and minority youth to consider pursuing careers in aviation and aerospace. He named his plane "Inspiration," and has said, "I want my historic venture to be for young people. They can look at me and realize that if I can achieve my dream, they can too." I look at young men like Barrington and my heart smiles. I have always been extremely proud of my personal beliefs that the true judge of a person is indeed their character, and not the color of their skin. So it is with great sadness when I watch PBS specials like “Frontline”, showing so many “inner city” young people of all colors taking their lives down a dangerous path littered with the corpses of those before them, victims of a 'gangsta' lifestyle that idolizes drugs, guns, hip-hop music, graffiti and the deplorable treatment of women. As I watch these poor people in these ghetto neighborhoods try to get a foothold on life, I always wonder why they can't see that if they just go to school, get an education, move away, and become law-abiding citizens, they'll have a decent shot at living The American Dream. Yes, I know that sound simplistic, but Barrington Irving is PROOF that it can be done. 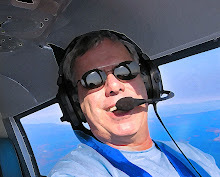 In 2003, Barrington began calling aircraft manufacturers with the unlikely request to borrow, lease, or donate a plane he could use to make aviation history. When no one said yes, he decided to ask manufacturers of the various components to donate just one of their individual products to him; he also asked Columbia, an aircraft manufacturer, whether they’d agree to assemble the plane if he could produce the parts. During the next year, with support and guidance from Miami Executive Aviation, he visited aviation trade shows throughout the country and secured more than $300,000 in donated components—the engine, tires, cockpit systems, seats, and so forth—and Columbia built him the world’s fastest single-engine piston airplane, ready to be modified with extended fuel tanks a few weeks before the global flight. That is such an awesome story. You can learn about Barrington here, read his blog here, and track his flight here. More than 4000 people are predicted to be waiting at Barrington's arrival ceremony in Miami, now scheduled for the last week of May. I can only hope that someone has invited the few remaining Tuskegee Airmen, because those wonderful senior pilots sure deserve to be a part of this great, great day. Black, white, brown, yellow, purple. Makes no difference to Av8rdan what color your skin is...if you're a pilot or wannabe, you're always welcome in my sky, anytime!